On Tuesday, three men arrived in a taxi and walked into Istanbul’s Ataturk Airport wielding assault rifles and suicide bombs. They indiscriminately shot their way past a security checkpoint and then set off their bombs, killing 44. The tactic was a familiar one, practiced in Paris and Brussels, but the nationalities of the perpetrators were not: Russian, Uzbek, and Kyrgyz. And that raises a pair of new security challenges for a Turkey still reeling from one of the worst terrorist attacks in its history. Large numbers of migrants from former Soviet nations like Uzbekistan already live and work in Turkey, so militants sent into the country from Syria or Iraq have a tight-knit community of expatriates they can disappear into. That means, in turn, that Turkish security personnel who have long focused on their country’s restive Arab and Kurdish populations must now look for signs of radicals hiding among their Caucasian and Central Asian communities as well. Turkish police have identified Ahmet Chatayev, a Chechen terrorist, as the mastermind of the attack, according to the Turkish newspaper Yeni Safak. He is described as working for the founder of the Caucasus Emirate and joined the Islamic State in 2013. Chatayev is currently wanted in Russia on terrorism charges and is sanctioned on a U.N. terrorism list for “training and redeploying” Russian-speaking militants in Syria back into Russia. Quoting unidentified intelligence sources, the Turkish newspaper said Chatayev planned the attack in a rental house in an Istanbul neighborhood near a shopping mall. And it said surveillance video shows the terrorists taking a taxi from the shopping mall to the airport on the day of the attack. Although Turkey and Western governments believe the Islamic State was linked to the massacre, it remains unclear if the attackers were dispatched to Turkey by top Islamic State leaders. But if the effect of the Istanbul bloodshed persuades the group’s commanders to call on Russian-speaking cadres to launch more terrorist attacks, it would mean the extremists have committed some of their most capable fighters to their foreign terrorist enterprise. An unprecedented crackdown has the country’s liberal activists reconsidering everything. CAIRO — The Egyptian government worked intensively to make sure that something important happened in Tahrir Square on Monday: nothing. It was the first time since 2010 that Jan. 25 passed without demonstrations disrupting the normal pace of daily life. An Interior Ministry source told the Egyptian daily el-Watan that the government had dispatched 180,000 security forces across Egypt to ensure quiet. The effort succeeded. The 35 protest marches organized by the Muslim Brotherhood to “shock and shake the junta … with your thundering protests” fizzled without a trace. Leftist activists didn’t even bother organizing protests of their own. Ensuring this political silence was months in the making. Sisi’s government, according to lawyers and activists, engaged in a sweeping crackdown in advance of Jan. 25 that disrupted life across downtown Cairo and even affected the cases of those arrested on unrelated charges. The government left nothing to chance in ensuring that it kept a firm grip on Tahrir Square. In the run-up to the anniversary, security forces raided more than 5,000 homes in central Cairo, and police, on little more than a whim, regularly searched passersby and occupants of the area’s cafes. Where’s Aung San Suu Kyi When Burma Needs Her? It’s time for Aung San Suu Kyi to stand up for her country’s persecuted Rohingya minority. This month, U.S. President Barack Obama’s administration made two of its strongest statements yet about what experts call the “early warning signs of genocide” in Burma. Obama said last week that Burma must end discrimination against the country’s beleaguered Rohingya minority to succeed in its democratic transition. Assistant Secretary of State Anne Richard followed up with an even sterner admonition: “We would love to see all Burmese leaders speak up on human rights and to realize that they should help the Rohingya,” she said. Her words to “all Burmese leaders” are pointedly aimed at democratic icon Aung San Suu Kyi, whose stance on the Rohingya has ranged from troubling to nonexistent. The Nobel Prize winner — and prospective presidential candidate — is seen around the world as a beacon of hope for Burma, but the Rohingya crisis has cast a dark shadow over her democratic credentials. As thousands of Rohingya flee to Burma’s democratic neighbors — Indonesia, Malaysia, and even earthquake-ravaged Nepal — the international community cannot ignore their persecution. They have suffered violent pogroms from Buddhist extremists. Their many successfully-run businesses have been burned. The government has barricaded them into concentration camps, where they are in dire need of food, water, and medical help. Aid groups that have been trying to help them face being banned from the country. Meanwhile, Aung San Suu Kyi’s response to this — the greatest human rights issue facing her country — is shocking. In 2012, she said she “didn’t know” if the Rohingya could be citizens. In 2012, she said she “didn’t know” if the Rohingya could be citizens. In doing so she aligned herself with the government’s official policy that the Rohingya don’t exist. In fact, Burmese officials threatened to boycott the recent regional conference to address the migrant crisis if the other participants so much as used the word “Rohingya.” This is in spite of the fact that the Rohingya have lived in Burma for centuries — some scholars say they are indigenous people of the Rakhine state. President Recep Tayyip Erdogan is hunting down his Gulenist opponents in the media, and one high-profile turncoat may be his secret weapon. In the informal hierarchy of the Gulen movement — a powerful if opaque Islamic group with numerous followers in Turkey’s media, police, and judiciary — Huseyin Gulerce used to be as close as it gets to the top. In the 1990s, he headed Zaman, a top-selling Gulenist newspaper currently in the crosshairs of a government-backed terror probe, and the Writers and Journalists Foundation, the movement’s public relations arm. He first met the movement’s leader, the Islamic preacher Fethullah Gulen, in the summer of 1980. During his years as editor of Zaman, he says, the pair would meet every week. After Gulen moved to the United States in 1999, fleeing charges of conspiring to overthrow Turkey’s secular order, of which he was later acquitted, Gulerce traveled to see him “twice per year, on average,” he says. He became known, at least in those days, as Gulen’s point man in Turkey. Today, Gulerce finds himself at the heart of an investigation poised to deal a potentially fatal blow to the movement and to press freedoms in Turkey. On Dec. 14, he was detained, along with 26 Gulen sympathizers, on charges of founding a terrorist group. On the face of it, the suspects — who include journalists working for Gulenist media outlets, police officials, and even the producer of a fictional TV drama — are being accused of attempting to frame a rival Islamic sect, the so-called Annotators, as an al Qaeda offshoot. According to most observers, however, they are paying the price for exposing, and perhaps engineering, a December 2013 corruption scandal that implicated a number of top officials, including Turkish President Recep Tayyip Erdogan. On Dec. 19, a Turkish prosecutor raised the stakes even further by requesting an arrest warrant for Gulen himself, who resides in Pennsylvania. The same day, a Turkish court ordered that eight suspects in the investigation be released from custody, including the current editor of Zaman. What’s Stopping Turkey from Saving Kobani? The American effort to pressure Ankara to take on a larger role in Kobani, however, has so far been ignored by the Turks. Foreign Minister Mevlut Cavusoglu said yesterday that it was “not realistic” to expect Turkey to launch a ground operation on its own. Gen. John Allen, the U.S. envoy to the coalition against the Islamic State, is also holding talks in Ankara — though the State Department readout on his visit did not announce any agreement between the two sides, and suggested talks could go on for some time. 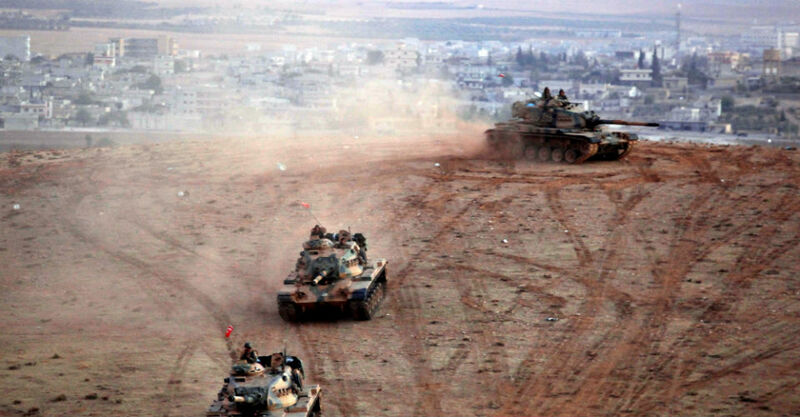 So, what’s stopping Turkey from saving Kobani? To try to answer that question, I posed a few questions to Suat Kiniklioglu, a former MP for the ruling Justice and Development Party (AKP) who rose to become the spokesman for the Turkish parliament’s foreign affairs committee, and the AKP’s deputy chairman for external affairs. Known as a member of the party’s liberal wing, he wasn’t included on the AKP’s list for the 2011 parliamentary elections; he has since served as the executive director of an Ankara-based think tank, and recently began a year in Washington as a visiting senior fellow at the Center for American Progress. Turkey has been pressing the anti-Islamic State coalition to broaden its mandate to include the removal of President Bashar al-Assad’s regime. Prime Minister Ahmet Davutoglu recently said that Ankara is “ready to do everything if there is a clear strategy” for Syria’s future — but argued that only attacking the Islamic State wouldn’t solve the root cause of radicalization, which is Assad’s grip on power. “For us the PKK is the same as ISIS,” President Recep Tayyip Erdogan said last weekend. Another AKP deputy tweeted that the Islamic State may kill, “but at least does not torture” like the PKK.